Nothing says crowd pleaser quite like warm and gooey mozzarella sticks dipped in marinara sauce. Fortunately, you no longer have to give up this classic appetizer dish on your ketogenic diet — believe it or not, we’ve found a way to make them low carb. The best part is you can also prep them ahead of time and store them right in the freezer, and when you are ready to enjoy, all you have to do is heat up the coconut oil and fry until golden brown. These mozzarella sticks are not only tastier than the ones you order at the restaurant, they are healthier as well. Unlike the commercial variety, these sticks contain no hidden carbs that kick you out of ketosis, no inflammatory grains, and no unhealthy vegetable oils. And since it’s so easy to increase the serving size, why not throw these into your weekly meal prep? 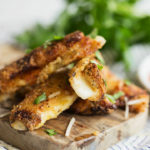 Then you can rest assured that when the craving for something piping hot and oozing with cheesy deliciousness kicks in, keto mozzarella sticks are only a few minutes away. Whether you are whipping up a fresh batch of these or quadrupling the recipe to store in the freezer, these mozzarella sticks are one of the best savory snacks. Place cheese in the freezer overnight to harden. When you are ready to make your mozzarella sticks, add coconut oil to a small to medium sized cast iron skillet and heat under low-medium heat. Add egg to a small shallow bowl and beat well. Add almond flour, parmesan cheese, and seasonings to a separate shallow dish. Coat cheese in egg, then evenly coat in dry mixture. Place on a wire rack or plate and repeat with remaining sticks of cheese. Cook mozzarella sticks until golden brown on all sides, about 1-2 minutes. Remove from oil and place on paper towels. Sprinkle with parsley if desired. Serve with keto friendly marinara sauce.